I made up some 1" thru hole Teflon washers, I've used these for years during rudder installations. I use these between any item that makes metal to metal contact. Used between the safety collars and the top rudder brace to control up and down movement in your rudder. O.D. is 1 1/2", I.D. is 1 1/32", Thickness is 1/8". Fits 1" prop shafts or 1" rudders. New smooth / lightweight design. Made from 6061-T6 aluminum with a nice machined finish. Can be easily polished or anodized. 2 3/8" outside diameter and 11/16" wide. Both 5/16" tapped holes do not break through as to not expose the threads for a clean look. Supplied w 2x 5/16"-24 stainless steel socket head cap screws. New billet Top Rudder Support Bearing, Made from 6061-T6 aluminum. Direct replacement for the painted steel unit in your boat now. Utilizes the same existing holes in your top rudder support brace, except these have 2x counter bored holes for 1/2" socket head cap screws for a clean look. 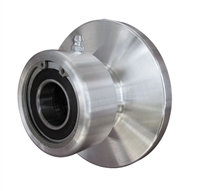 Uses a 1" double sealed roller bearing. Same dimensions as the painted steel unit. Length: 5", Width: 2 3/4", Hole Spacing: 3 7/8", Height is 7/8". New design. Made from 6061-T6 Aluminum that is machined finish. 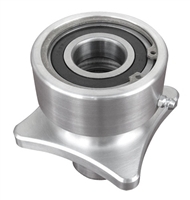 Sealed bearing design (just like our billet prop shaft log seals). No more housings to wear out!!! The prop shaft rides on the bearing. Our new rudder stuffing box has a standard 3 5/16 square mounting flange. So it is a direct replacement for your older style stuffing box. I did not put in mounting holes because every hull is different and has a variety of hole sizes and patterns. All you have to do is transfer punch the existing hole locations in your hull to the rudder box and drill the size you need. Fits all standard 1 1/2 diameter thru hull holes. I left the 1 1/2 diameter section that goes thru the bottom of your hull long (1 3/4 long) to accommodate any hull thickness. You will have to trim to fit. Starting from the top of the stuffing box to the bottom features a snap ring for safety to help retain the 1 sealed bearing that is bored a few thousands larger than your rudder shaft. Next is an ample sized grease reservoir which is filled by the grease zert located on the outside of the rudder box housing. Two double lip grease cup seals are lightly pressed in as a second barrier to keep water out. The first water barrier is a 1/8 diameter o-ring that is below the grease cup seal. 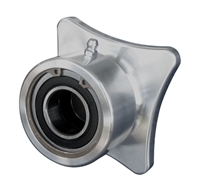 Our new rudder stuffing box has a standard 4 1/16 round mounting flange. So it is a direct replacement for your older style stuffing box. I did not put in mounting holes because every hull is different and has a variety of hole sizes and patterns. All you have to do is transfer punch the existing hole locations in your hull to the rudder box and drill the size you need. Fits all standard 1 5/8 diameter thru hull holes. I left the 1 5/8 diameter section that goes thru the bottom of your hull long (1 3/4 long) to accommodate any hull thickness. You will have to trim to fit. Starting from the top of the stuffing box to the bottom features a snap ring for safety to help retain the 1 1/8 sealed bearing that is bored a few thousands larger than your rudder shaft. Made from 6061-T6 aluminum. 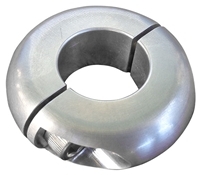 Standard 1" bore for 1" rudders, 1/4" keyway, 3/8" diameter clamp hole for rudder, Top cable clamp features two milled in scallops to help "bite" into the standard 3/16" cable. Top clamp has a built in clearance when tightened onto steering cable it will be flush with the top surface. Supplied with 2x 1/4" corrosion resistance grade 8 bolts that screws into to 2 heli-coiled holes installed into the quadrant. Also supplied will be 2x 1/4"-20 lock nuts for safety.